The difference between single- and double-pane glass. A major factor to consider when choosing replacement windows is the type of glass used. In this blog post, we will explain the differences between single- vs. double-pane windows and explain the benefits of double-pane glass. 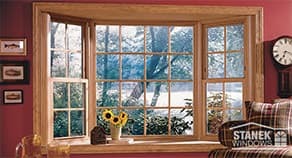 The main difference between a single- and double-pane window is the number of glass layers it has. Single-pane windows have one layer of glass that offers wind protection; however, glass is a poor insulator. Experts estimate that 70 percent of energy loss occurs in windows and doors, and 90 percent of window heat loss occurs through the glass. Poor insulation causes the outdoor temperatures to greatly affect the indoor temperature of your home. What is a Double-Pane Window? Double-pane windows contain two panes of glass separated by a space of air or gas that helps to slow the transfer of heat and cold. Because gas is denser than air, insulating gas is more energy efficient than air. The two gasses typically used in double-pane glass are Argon and Krypton. While the initial cost of double-pane windows is more than single-pane windows, the impact on your energy bills will be noticeable. With less heat and cold transferring through your windows, the cost to heat and cool your home will decrease significantly. According to homeadvisor.com, double-pane windows can reduce energy usage by up to 24 percent in the winter months and up to 18 percent during the summer. It’s important to keep in mind that to see energy-saving results, you must replace all old and failing windows in your home; not just one. Double-pane windows also help to shield your home from noise. The two layers of glass and insulating gas significantly reduce the amount of outdoor noise pollution that enters your home and the amount of noise that emanates from inside your home. This is especially beneficial for homes on busy streets or in noisy neighborhoods. 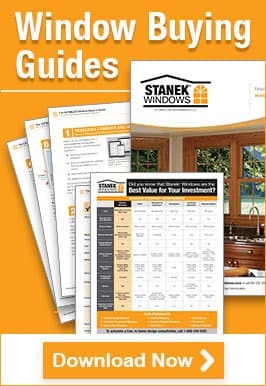 Why Choose Stanek for Your Double-Pane Replacement Windows? When buying double-pane windows, quality is top priority. While you may be looking for the lowest price you can find, the end result of cheap windows is not worth the initial savings. Improperly spaced glass can lead to failed seals and condensation buildup between the two panes and more. Stanek’s Comfort-Gard® PLUS double-pane glass uses a formulated multi-layer, soft-coat, Low-E coating and is insulated with Argon gas and blocks 90 percent more UV rays than ordinary single pane windows. Comfort-Gard® PLUS glass also retains more heat in the winter in order to keep your house warmer and reflects heat in the summer to reduce your cooling costs. Our warm-edge Super Spacer® technology and secondary urethane seal ensures that the Argon gas used to insulate your windows stays in place. Comfort-Gard® PLUS glass is available in all window options. If you’re interested in learning more about Stanek double-pane glass options, give us a call at 800-230-8301 or schedule your free, in-home estimate online today.